Anna decided it was time to check on the sweet potatoes and discovered that we have some huge tubers! I'm guessing this year's harvest is bigger than all our other sweet potato years combined. Still more in the ground! And we've still got 20% in the ground to be dug tomorrow! "Those are huge sweet potatoes!" Mark exclaimed before he even made it in the door. I could care less if Mark notices a new haircut, but I figure a husband who comments on my awesome sweet potatoes is a keeper. Very cool! How do you store them? We have a very mild climate, so we just leave them growing year-round and harvest as we want them. Wow! I didn't realize you were so tropical! I hope you'll write more on your blog sometime about what you can and can't grow in such a warm setting. We have to bring ours in because frost kills the vines and makes the tubers prone to rotting. We just store them on a shelf in the kitchen, though --- they seem to like room temperature conditions and not to need excess humidity the way white potatoes do. What a good picture of Anna, and you look so happy! 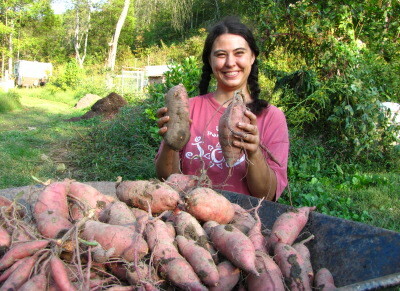 How could I not be happy with so many sweet potatoes? !